NHS strike: What impact will it have on services? 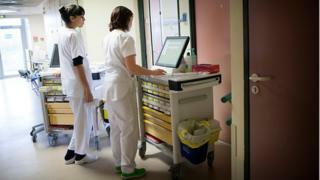 NHS workers in England are staging the first strike in more than 30 years over pay on Monday. It will start at 07:00 and end at 11:00 BST. Staff including midwives, nurses, ambulance crews, porters and office workers are taking part. Meanwhile, in Northern Ireland health workers are taking action from 11:00 to 15:00 BST. The full picture will not emerge until later in the day. All the unions involved say their members will be providing "life and limb cover". This means urgent and emergency services will not be disrupted, they say. For example, ambulance staff will still be handling 999 calls and midwives will be staffing maternity units. Instead, the strike is targeting more routine areas of care. So that could mean patient transport services not being run and antenatal and postnatal clinics being cancelled. Hospital outpatient appointments may also be affected as well as some routine surgery, such as hip and knee operations. Community clinics and walk-in centres could also be disrupted but GP practices are expected to run as normal. Practice nurses tend to belong to the Royal College of Nursing, which is not striking. Receptionists are not taking part. While this strike is happening in England, members of the GMB union in Northern Ireland, including a range of staff from ambulance crews and district nurses to cleaners, are also taking part, so there is likely to be some disruption. How many staff will walk out? The unions taking part have more than 400,000 members in the NHS in England out of 1.3 million staff. However, not all of them will be involved because of the reasons explained above. Two-thirds of midwives are expected to work, but the union says its members will be wearing badges to express their support of the walkout. Many nurses are not involved as the Royal College of Nursing did not ballot its members. The union has, however, been lobbying the government on pay. Doctors and dentists are not involved. In a word, pay. Ministers have awarded NHS staff a 1% increase, but only for those without automatic progression-in-the-job rises. These, designed to reward professional development, are given to about half of staff and are worth 3% a year on average. What is more, the pay is "non-consolidated" which means it is taken away after a year and does not count towards staff pensions. An independent pay review board had said the 1% increase should be across the board. But unions have described the offer as "appalling" and say staff are being treated "shoddily". Unison - the biggest health union taking part - says that since 2010, pay has fallen by 10% once inflation is taken into account. It also argues incremental pay is meant to reward the growing competence and skills that come with experience. But the government has argued that a 1% across-the-board rise is unaffordable. Ministers say if they agreed to it, 6,000 nursing jobs would have to go. They have put forward a similar deal for next year. In Scotland, a 1% pay rise was given to everyone, while no decision has been made in Northern Ireland. In Wales, ministers offered the same to staff as was on offer in England, although extra was set aside for the lowest paid. Some unions have started balloting their Welsh members about industrial action. When was the last time NHS staff went on strike? Staff - including doctors - took part in a strike over pensions in 2012. But this is the first national walkout over pay for 32 years. Nurses took part in industrial action in 1988 over working hours, while ambulance crews were involved in strikes and industrial action between 1989 and 1990. Midwives have never taken part in strike action before. The stoppage will be followed by four days of working to rule. This means staff will not be doing unpaid overtime and will be taking their breaks. What this means in practice remains to be seen. The unions involved acknowledge that staff will be reluctant to walk out on patients just because their shift has ended. There is also a strike by radiographers on Monday, 20 October. This is because they did not have time to give the formal notice needed to join the other unions this Monday. That action has the potential to affect X-ray and ultrasound services. Ahead of the strike, union leaders were warning they would be prepared to take more action if needed, but they were open to talks with the government.